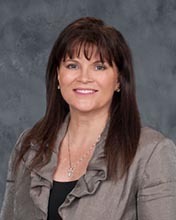 Denise Hardin, MSM, CLU® is Senior Vice President of the West Central Market Area. Denise began her career with State Farm® in 1989, when she became an agent in northern Kentucky. She then entered into agency field leadership in the former South Central region. In July 2002, she became an Executive Assistant at Corporate, moving to become Vice President – Agency for Washington, D.C. and Maryland in the former Mid-Atlantic Zone in 2003. After two years, she returned to what was then the Mid-America Zone, working with corporate on customer access. She also worked with the State Farm Bank® during this time period, focusing on the agent view of the banking process. In September 2008, she became Vice President – Agency for Kentucky and quickly joined the former Southern Zone as Agency Vice President. In January 2013, she became Vice President – Customer Care Center. Denise was named Senior Vice President for the West Central Market Area in October 2015. She is also a member of NAIFA and GAMA. Denise has her CLU® and Master of Science in Management. Denise has two children, Elizabeth and Will.